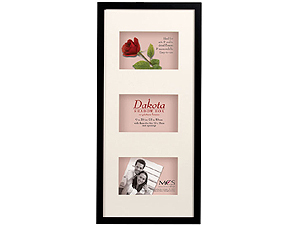 Versatile wood frame can display photos, arts and crafts, dried flowers, memorabilia or 3D collectables up to 3/4" thick. Includes mat with three 4x6 openings. This versatile Dakota Shadow Box pine Wood Frame can display photos, arts and crafts, dried flowers, memorabilia or three dimensional collectibles up to 3/4" thick. Outside dimensions 9-5/8" x 20-5/8" x 1-3/8"
Note: This frame cannot be shipped outside the 48 continental US States.